Pope Francis praises 'courage and daring' in rapprochement with despotic regimes, days after Cuba visit in which activists were repressed. Pope Francis praised the "courage and daring" required for adversaries to resume dialogue in a speech to the US Congress Thursday, in a nod to recent controversial overtures between Washington and its longtime foes, Cuba and Iran. 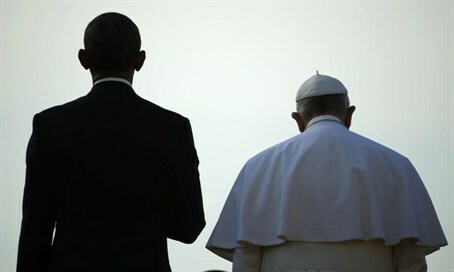 Francis did not single out any country by name, but his remarks clearly were intended as encouragement for US President Barack Obama's recent nuclear deal with Iran and rapprochement with Cuba. Ironically Cuba stepped up its crackdown on dissidents during the Pope's visit to the country earlier this week before his stop in the US, strengthening criticism of the rapprochement. Likewise Iran has continued to threaten to destroy Israel and is left with its entire nuclear program intact in the deal, which stipulates that it inspect its own covert nuclear sites. Both diplomatic initiatives have come under fire from US conservatives both in Congress and on the Republican presidential campaign trail. "When countries which have been at odds resume the path of dialogue - a dialogue which may have been interrupted for the most legitimate of reasons - new opportunities open up for all," Francis claimed. "This has required, and requires, courage and daring, which is not the same as irresponsibility. A good political leader is one who, with the interests of all in mind, seizes the moment in a spirit of openness and pragmatism." "A good political leader always opts to initiate processes rather than possessing spaces," he said. Despite his apparent praise of Obama regarding Cuba and Iran, the pope took an action critical of Obama just hours earlier, visiting nuns who are leading the legal battle against ObamaCare's birth control mandate. Francis, who visited Havana before traveling to Washington for his first US visit, served as a key intermediary in secret US-Cuban contacts that led the two countries to restore diplomatic relations in July after more than 50 years of enmity. In Cuba, the Argentine-born pontiff stressed the need for reconciliation. The Vatican also has welcomed the nuclear deal reached in July between Iran and the world powers - the United States, Russia, China, Britain, France and Germany. It places temporary limitations on Iran's nuclear program without reducing that program, in return for a huge windfall in international sanctions relief to the leading state sponsor of terror.